SnaPatch can connect to your Hypervisor (VMware and / or Microsoft HyperV) environment to allow snapshots to be taken of your virtual servers before patches are deployed. This will give the you a quick rollback in case of an issue from the patch deployment. 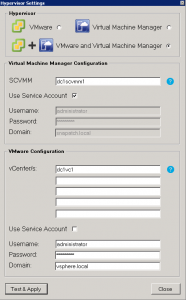 SnaPatch interacts with up to 5 vCenter servers allowing control of your VMWare virtual machines. You will need the vCentre’s name or ip address and an account with appropriate permissions to allow control you to perform snapshots. 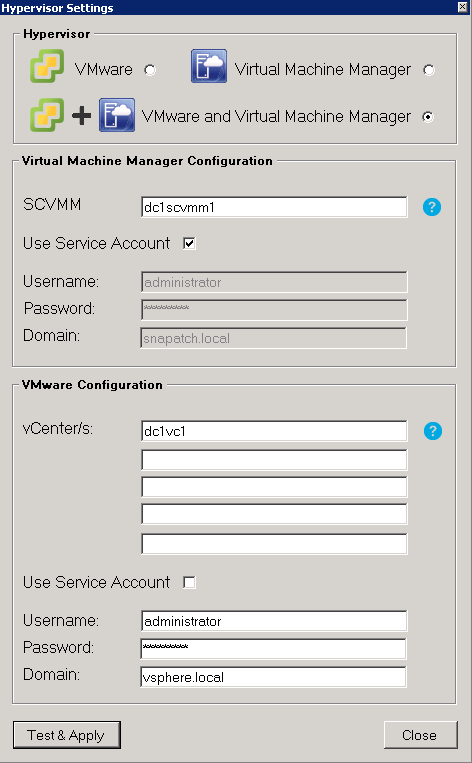 SnaPatch also can connect to your Microsoft System Centre Virtual Machine Manager Server. As with the vCentre settings, you will be required to input, name or ip address and an account with correct permissions to allow SnaPatch to create a HyperV checkpoint of your VMs. For further information on SnaPatch, click the link to see how SnaPatch extends Patch Management for Microsofts SCCM.